Summer vacation will be upon us before you know it. 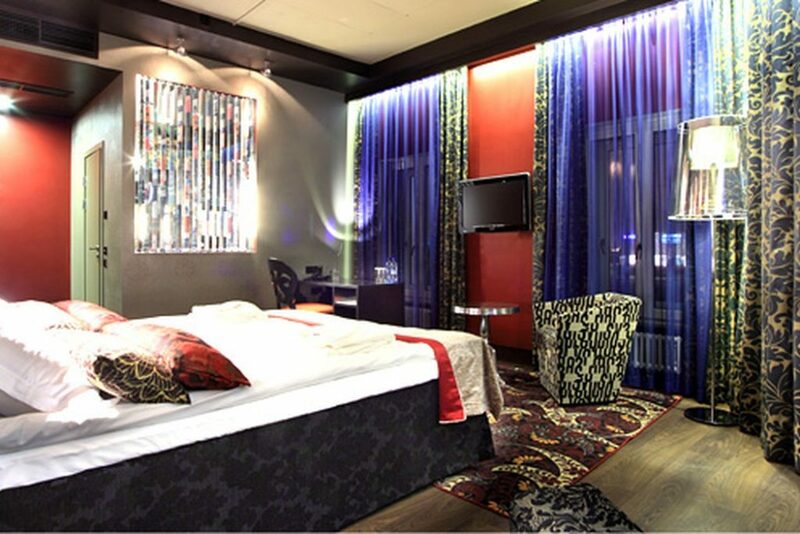 Best to start planning your hotel stays now. If you’re reading this, my guess is you’re into books. What better way to enjoy your vacation than by staying at a hotel known for its literary bend? We offer suggestions for 16 hotels we researched for you that are sure to feed a bibliophile’s appetite. For a book collector’s Bucket List, make sure this 1894 palace, with its massive library featuring more than 5,000 volumes of rare books and manuscripts, is at the top. According to the hotel’s website you’d need to read a book a day for more than 16 years to make it through their entire collection. Disconnect – literally –at this book lover’s dream hotel. Sylvia Beach Hotel was named in honor of Sylvia Beach, the expatriate American bookseller and publisher who opened Shakespeare and Company bookstore in Paris in 1919. Located in Newport on the central Oregon coast, Sylvia Beach Hotel sits on a bluff above Nye Beach and the Pacific Ocean. Originally built in 1912 as the New Cliff House hotel, the structure was renovated in the 1980s to become a 21-room literary themed bed and breakfast with a homey and eclectic charm that attracts readers, writers, and travelers from all over the world. It has been listed on the U.S. National Register of Historic Places. 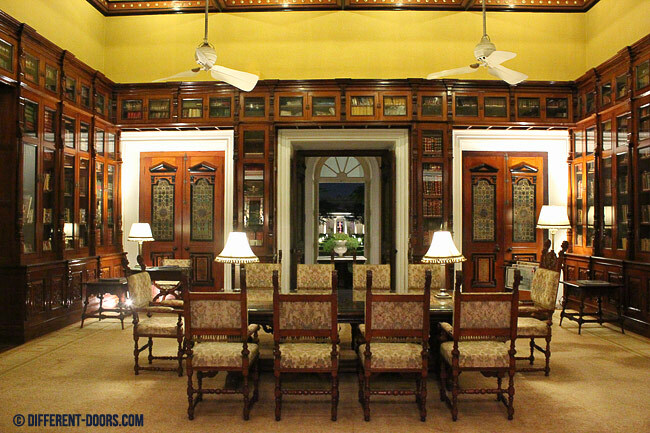 Each room includes details and books to reflect the life and writings of 21 different authors. Guests can enjoy a book with a view in the quiet and cozy haven of the third-floor oceanfront library. Family-style dining for breakfast and dinner brings guests and locals together to share conversation and adventures in our Tables of Content Restaurant. There are no telephones, TVs, or WiFi in rooms at Sylvia Beach Hotel. The allure is beach quiet—gathering one’s thoughts, writing, reading, and savoring the wonder of ocean and sky. Unplug, unwind, and sleep with your favorite author. 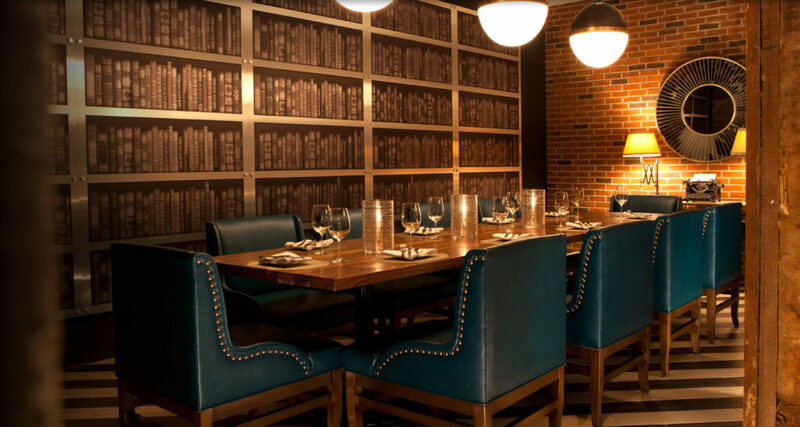 Brush up on classic literature at The Commons Hotel. Guests are encouraged to borrow books during while staying at the hotel, but if you can’t bother to pull yourself out of bed, the hotel’s on-call Book Butler will deliver books right to your room. How’s that for service?! One of the city’s most recognizable historic landmarks, the iconic Heathman Hotel in the heart of downtown Portland blends rich history with a reverent appreciation for the arts. 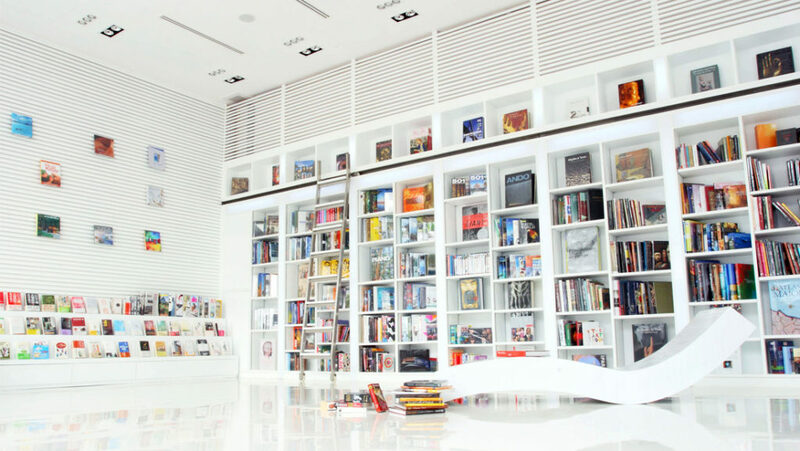 The hotel’s library boasts more than 2,700 volumes signed by the authors, while its world-class art collection celebrates the work of contemporary artists. Here, the art of service is alive and well, from the welcoming Beefeater doorman to the attention of your personal concierge. The Gladstone states it is not a hotel but, rather, a library that just so happens to offer accommodation to its patrons. The Gladstone library’s collection boasts more than 250,000 volumes. In Wales it’s second only to the National Library of Wales. Try your hand at writing your own book. Plenty of others have done so. 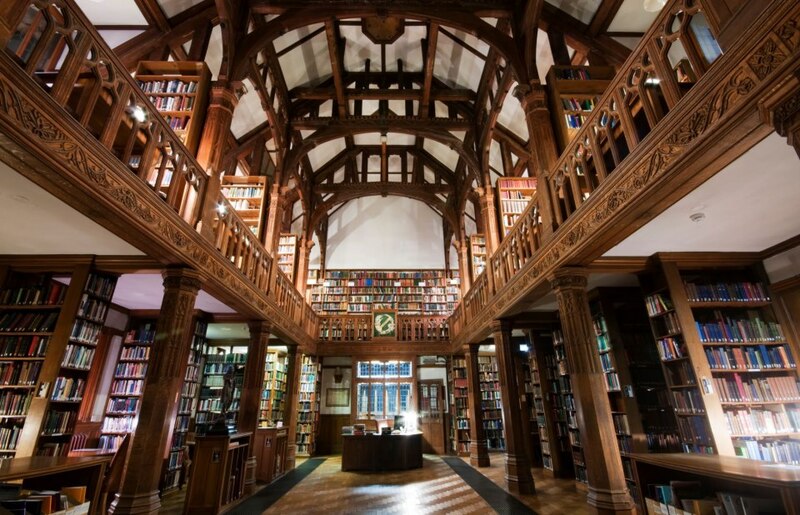 According to Gladstone’s website, more than 300 books have been written within the reading room’s hallways. The hotel’s rooms, decorated for the literary-minded, provide just what you need for the night, but are spotless nonetheless. The onsite café offers breakfast, lunch, dinner, and, of course, what English hotel wouldn’t serve afternoon tea to go along with that book you’re reading … or writing? 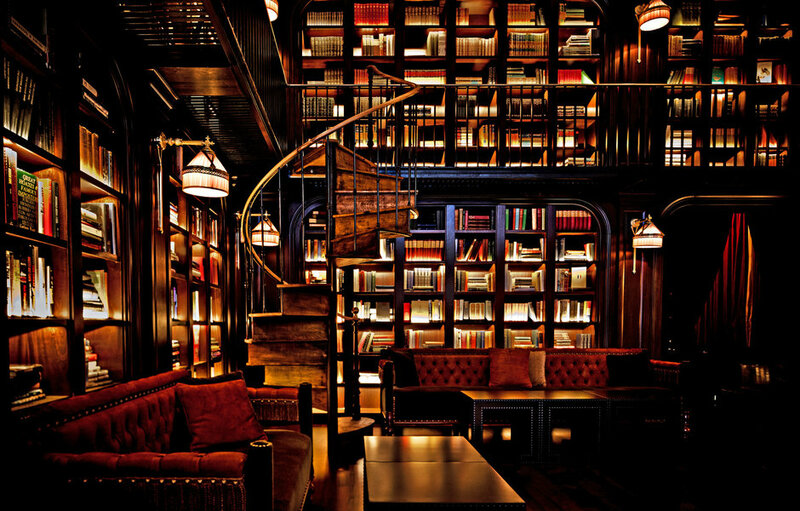 The Library Hotel concept is inspired by the Dewey Decimal system. 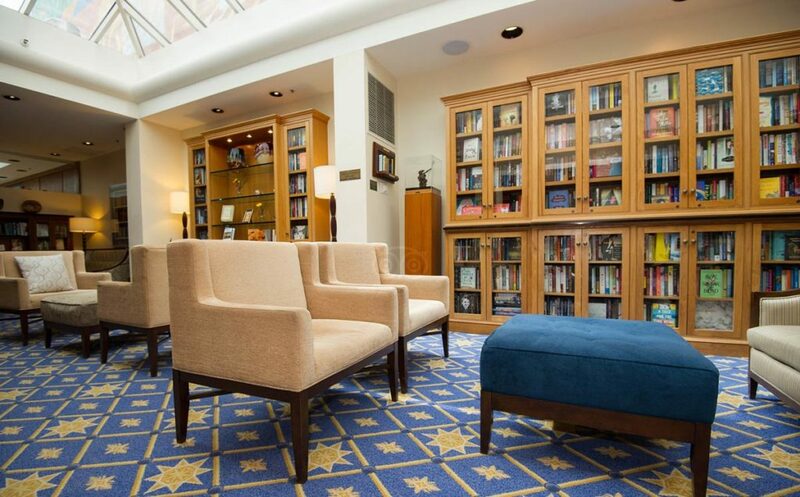 Each of the 10 guestroom floors honors one of the 10 categories of the Dewey Decimal System, and each of the 60 rooms is uniquely adorned with a collection of books and art exploring a distinctive topic within the category it belongs. 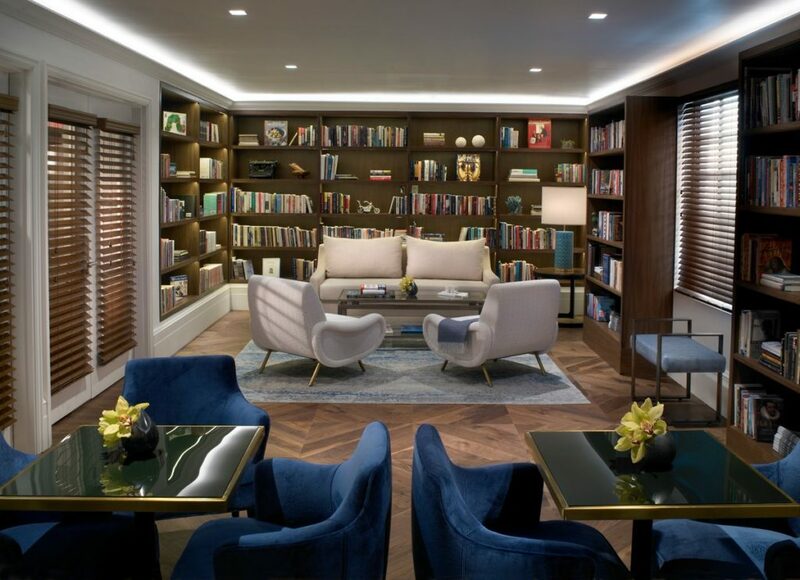 Guests are invited to unwind from their urban adventures by enjoying the quiet exploration of more than 6,000 books. 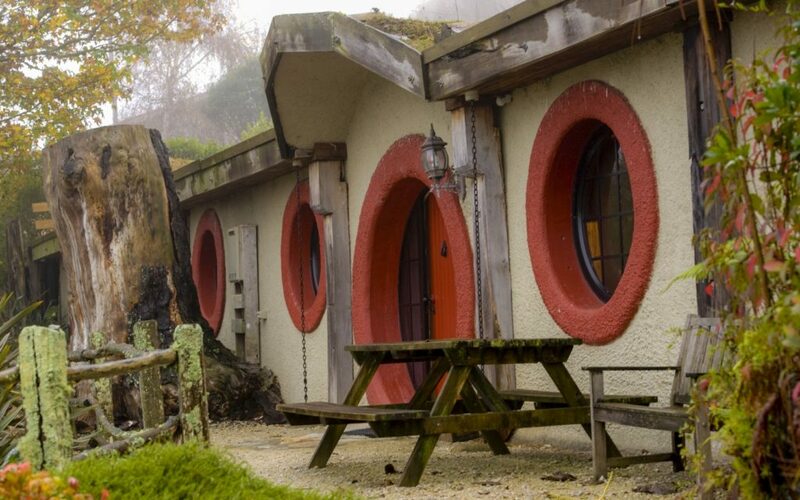 Sleep like a hobbit in this quirky motel, which was the former movie set of the Hobbit movies. Built in 1999, and rebuilt in 2009, the set is open to guests eager to visit the hobbit holes featured in the movies, have a drink at the Green Dragon Inn and experience life, Shire-style. Each “room” has specially designed furniture and decor and having been built using polystyrene blocks, so they have added warmth in the winter and a cooling effect in summer. The two units available each has a separate room with two sets of bunks and a double bed in the main living area. They also offer two hobbit family units right next to each other. Each unit can sleep up to six people. In the footsteps of local authors Paul Verlaine and Arthur Rimbaud, Victor Hugo and Juliette Drouet, or George Sand and Alfred de Musset, guests can soak up the typical atmosphere of a period guest house in which everything – from the staff’s uniforms to the stylish decorative details – draws you into the deliciously romantic atmosphere of that era. Working with Powell’s bookstore, The Nines boasts a lending library of more than 3,000 books for their guests. Located next to Pioneer Square and the central business district in one of the country’s premier walking cities, this luxury hotel in Portland is an ideal spot for launching all of your adventures. 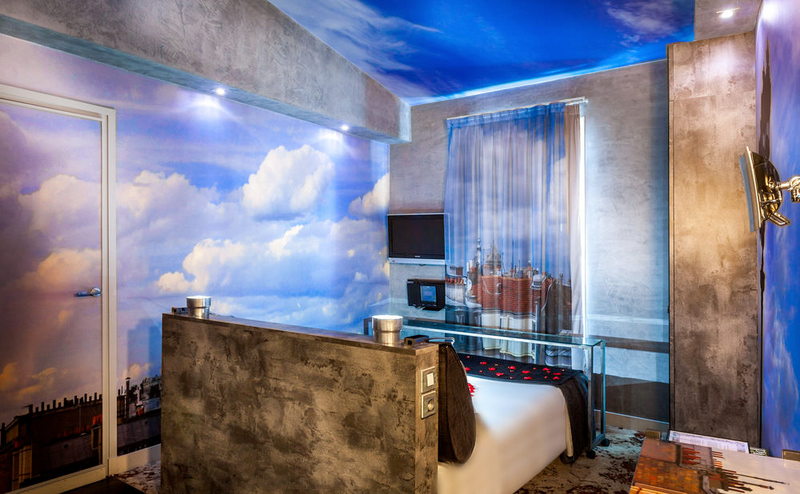 Inspired by Dostoyevsky’s Crime and Punishment, two suites in the hotel are named Rebirth and Ego. The patterns of the carpets contain the initial passages of the novel in both Russian and English. F. Scott Fitzgerald and his wife, Zelda, were regular guests of The Plaza. 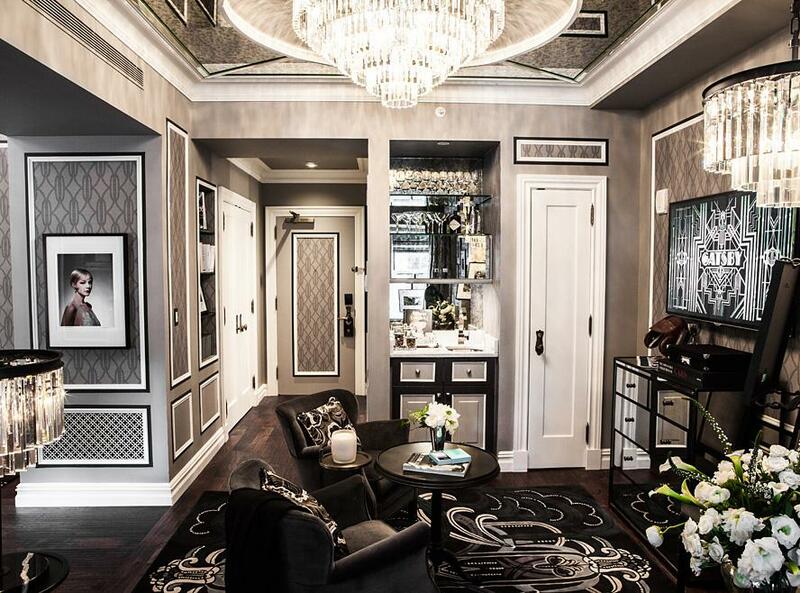 So, as a tribute, the hotel designed a room after them, called The Fitzgerald Suite, designed by Catherine Martin, co-producer of Braz Luhrmann’s adaptation of The Great Gatsby. 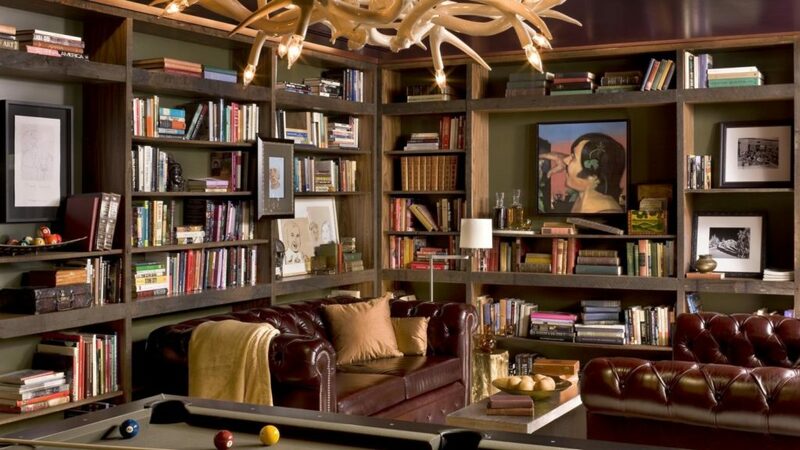 Recognized by AAA as the only independent hotel in the country to offer a lending library of this size and scope, The Heathman is proud to feature one of the largest autographed libraries in the world. Our outstanding collection includes signed editions from Nobel Prize and Pulitzer Prize winners, U.S. Poet Laureates, a former United States President and represents more than 30 years of guests who have signed their books to contribute to their valuable collection. 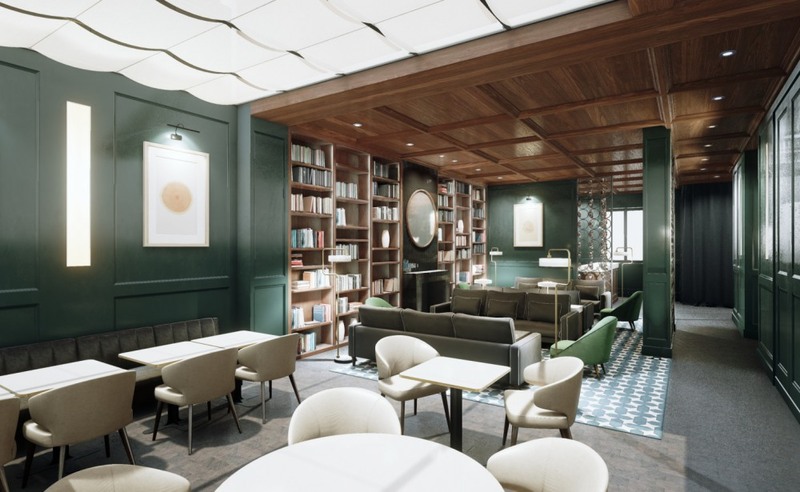 This exclusive library, with greater than 2,700 signed volumes, exemplifies the Heathman Hotel’s dedication to and passion for literature and its everlasting effect on the community. In partnership with Powell’s Books, the Heathman Hotel strives to provide its guests with a uniquely rich and local literary experience to remember. 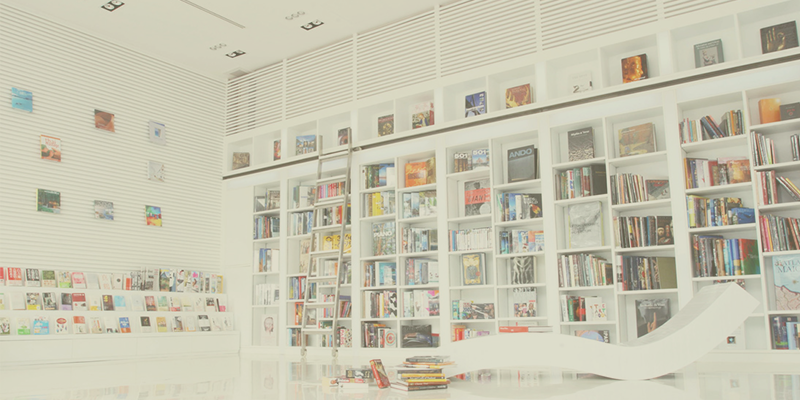 Open 24 hours a day, the Mezzanine Library is an inviting place for guests to relax and read. 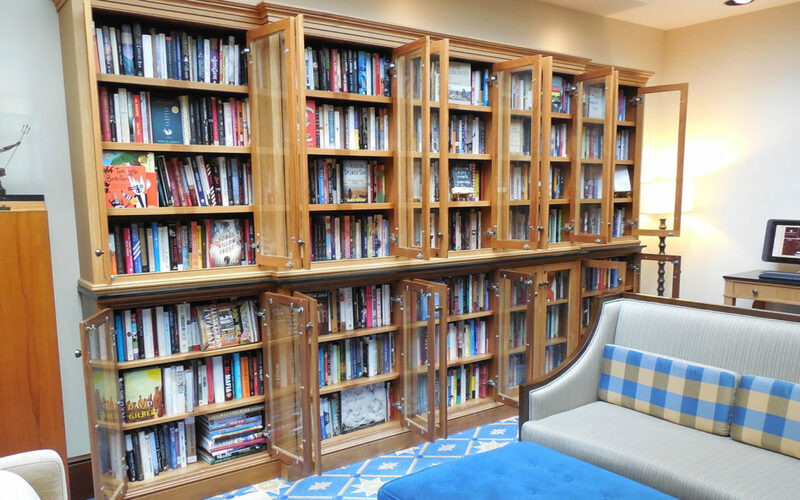 Hotel Guests are invited to peruse the contents of our eclectic collection, and their staff can even recommend and check out books so guests can enjoy them in their luxury room or suite. The Apostrophe Hotel believes that every room is a poem, therefore, each room features a verse, starting from the ground floor and continuing upwards. 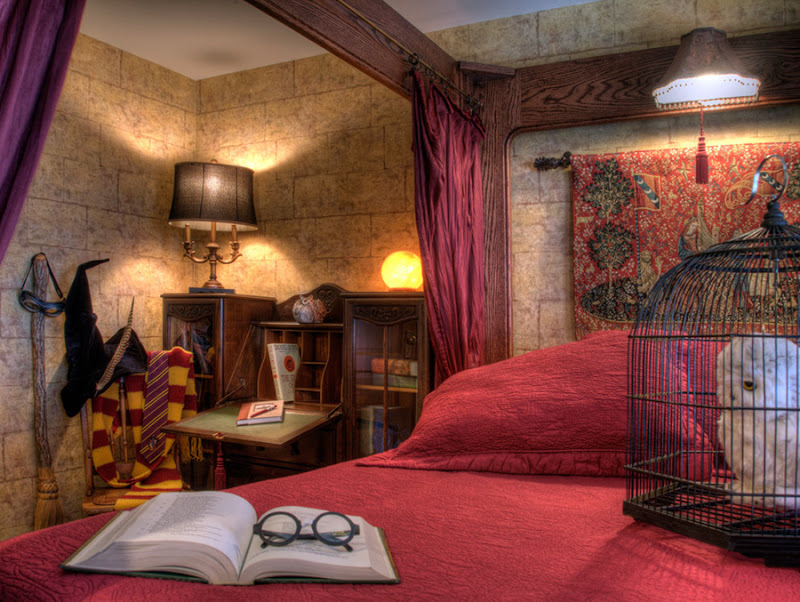 Each room has a unique design based on a literary theme. The Betsy is Miami’s only literary arts hotel. It is home to exiled Zimbabwean writer Chenjerai Hove. It is a refined, beach-side haven located in the heart of South Beach, committed to timeless luxury and service, while offering incredible ocean views, exquisite amenities, world-class cuisine, and a unique commitment to the arts.